Development of cancer is a multistage process which includes many molecular alterations. It is evinced that a single genetic alteration is often insufficient to lead to the development of cancer. Hence, involvement of diverse genetic alterations occurs in cancers which result in different behaviors of the cancer cells. This resultant heterogeneity gives rise to differed clinical behavior and treatment outcome of patients with similar diagnostic cancer types. As per the conventional protocol, cancers are diagnosed depending on the morphology of cancer cells or tissues. However, the analysis of morphological features for cancer diagnosis and prognosis has been found to be fairly complicated. As there exists a direct association between genetic features and protein expression, molecular characteristics at the genomic and proteomic level in particular, would be very useful to categorize cancers. Moreover, it provides extreme specificity and sensitivity when coupled with appropriate signal transduction and amplification mechanisms. This can be achieved with the help of different biomarkers. The biomarkers possess potential to differentiate cancer patients for different and appropriate treatment options and also to predict response to specific cancer therapies. Thus discovery of precise biomarkers can definitely provide easy and effective diagnosis, prevention and therapy for diverse malignancies. 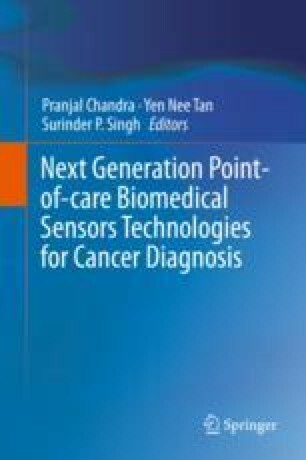 This chapter describes the different biomarkers and their importance in the diagnosis and prognosis of various cancers. This work is supported by BT/P/ABK/01 Start-up Grant awarded to Dr. Ajaikumar B Kunnumakkara by the Ministry of Human Resource Development, Govt. of India. Conflict of Interest: The authors express no conflict of interest.